It's been amazing to have been able to share five days packed full of content from wise and experienced people passionate about equipping us to be confident engaging with the topic of mental health. 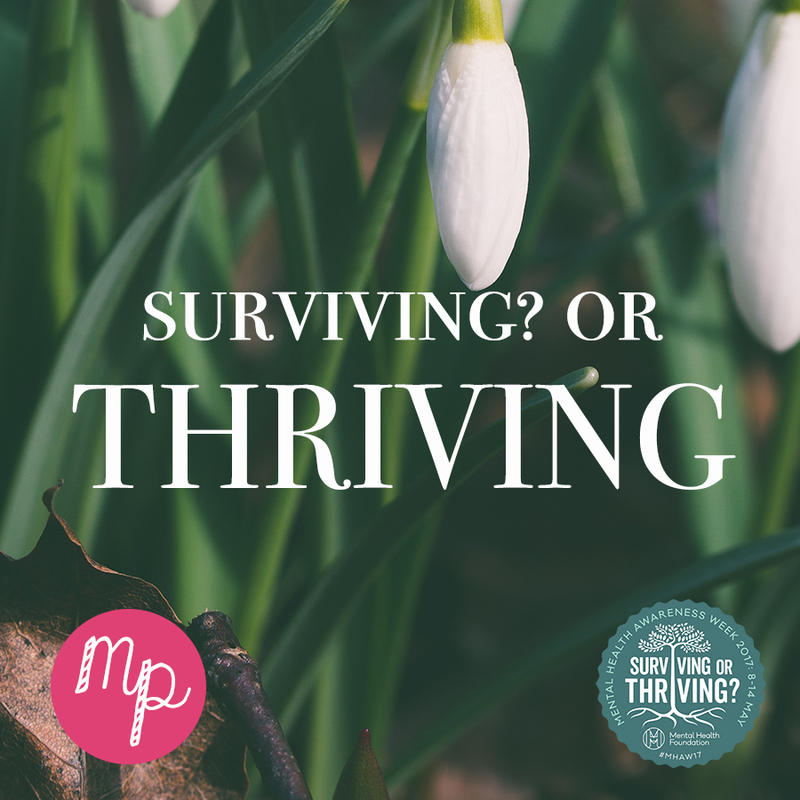 The theme for Mental Health Awareness Week this year is Surviving or Thriving?, grappling with what it means to maintain and recognise good mental health, rather than just defining it as 'the absence of an illness'. For most of my life, anxiety hasn't played a big part in my day-to-day. Growing up, I got nervous at normal things, like public performances or exam results - but it's only been this past year that I've experienced a much more persistent and irrational form of anxiety. It might have been the move to the fast-paced city of London, or maybe it's been stepping up into a far more intense and high-pressured working environment - but either way, I've found myself feeling burdened under anxious thoughts and feelings, and it has drawn me to reflect more thoroughly on what it means for me to have good mental health. Practically, I've found that writing down my thoughts on paper has really helped me to get a perspective on my worries. I've also found that going for an evening or whole day without any phone or digital devices has helped to clear my mind. Putting aside time to be outside and to exercise always gives me more mental space and perspective too. But what does 'good mental health' look like from a faith perspective? My first personal experience of a serious and life-threatening mental illness, which was when my Granny experienced a mental breakdown a number of years ago. I remember asking her whether she found it easy to trust in God during this time, not knowing how faith could fit in to her situation. She told me that when her mind was sick, it wasn't altogether surprising that her faith felt 'sick' too. She said that she didn't find it easy to pray or to worship, but she did know that God was there and hadn't abandoned her. Working this principle out on a smaller scale in my life, when feeling anxious or overwhelmed, I've often returned to Psalm 121:1-4, as well as to the song God I Look To You. The first line of this song says: God I look to you - I won't be overwhelmed. This is often a hard line to sing or believe when life feels totally overwhelming - but it's actually a powerful statement of trust in an unshakeable God who has not abandoned us, and will not leave us alone. Though so many of us might feel overwhelmed by the pressures of life and the disappointments and pain along the way, we can see throughout the scriptures that we've got a God who will never let us go. We will NOT be shaken or abandoned, because He is a God who does not slumber or sleep. No matter how shaky my faith or state of mind might feel, I can say with confidence in an almighty God that I won't be overwhelmed. Lucy grew up in Cambridge and studied at university in Durham. She got married last summer and now lives in London, working with brilliant entrepreneurs every day. She has the absolute joy of being part of the Holy Trinity Clapham church family.